I’d bet most of us understand an the initially proposed idea and its ultimate implementation are going to differ. Ideas are cheap, as they say. It’s what happens after the idea is proposed where success or failure is determined. Typically, the “after proposal” focus is on the execution of the idea. But there’s a phase between the idea proposal and the execution of it. It’s a phase where the idea is molded and sharpened. 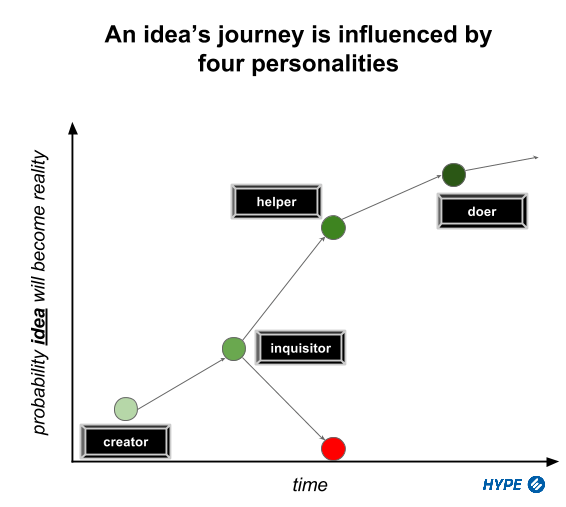 On the HYPE Innovation blog, I’ve written about them in: Four personalities that determine innovation success or failure.